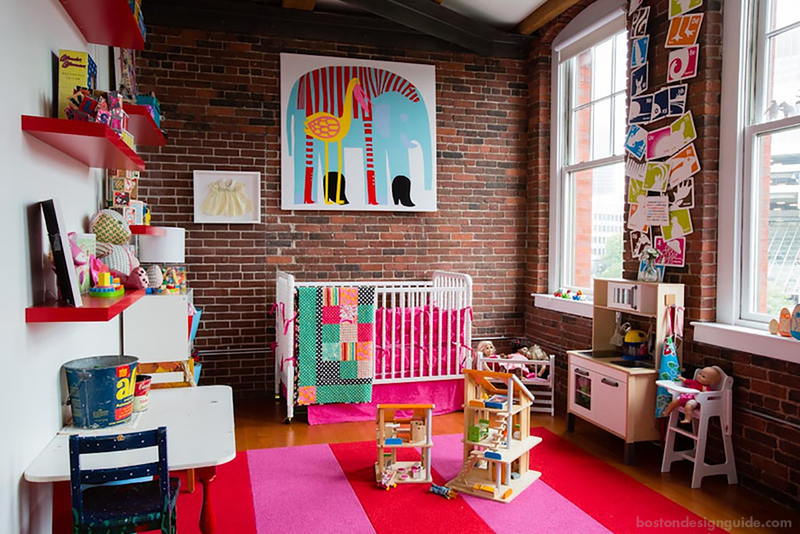 Adorable spaces for the baby, tot and tween. Because you’d give them the world (and the sun, moon and stars) if you could…. The North End nursery above, built by S+H Construction, is chock full of spirit and character. Its many architectural merits (bricked walls, oversized windows and casings) are played up by the room’s lively color palette. The homeowner did the interior design (thanks, Mom! 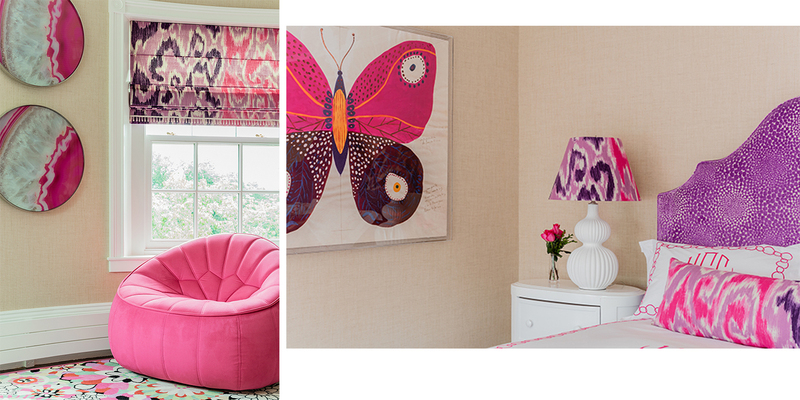 ), layering the space with pops of red and fuchsia, charming art (including a framed dress!!!) and classic toys for hours of playtime. Interior designer Lindsay Bentis of Thread Art & Design gave an ethereal look to this LDa Architecture & Interiors nursery, above. 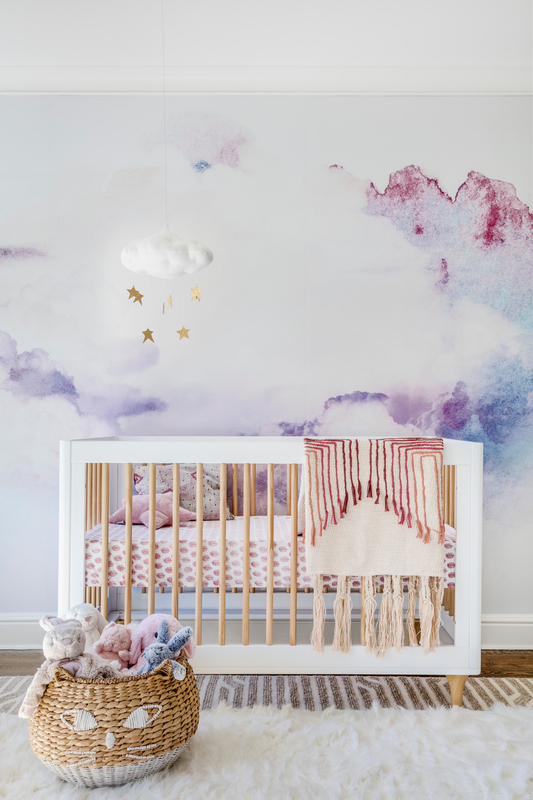 The wallpaper, rich with watercolor clouds and light, set the tone for the celestial space, in which a sweet baby girl can gaze upon pink and purple swirls and the stars and clouds of a mobile. A deeply piled rug provides a cushion for crawling, while an Anthropologie throw (she’ll thank Bentis for that later) pulls the vision together. Conceived by Barbara Elza Hirsch of Elza B. Design, this darling nursery was designed for the Junior League of Boston’s 2017 show house. We love how Hirsch selected ageless colors like citron and lavender over more pervasive, cutesy tones, and how she toyed with curves and patterns with a shelf life beyond age 5. This room is made for the enjoyment of both child and parent—how else do you explain the elephant wall mount (didn’t you just love Babar?) on grass cloth? The gal who owns this room is destined to be the envy of her friends. Built by C.H. Newton Builders with an interior design by Lewis Interiors, this space is dynamic and vibrant, and packed with fun-loving patterns that play well with one another. Its colors—from mint to bubblegum to grape—are better for their neutral backdrop, and layered in the drapes, art, rug and headboard. 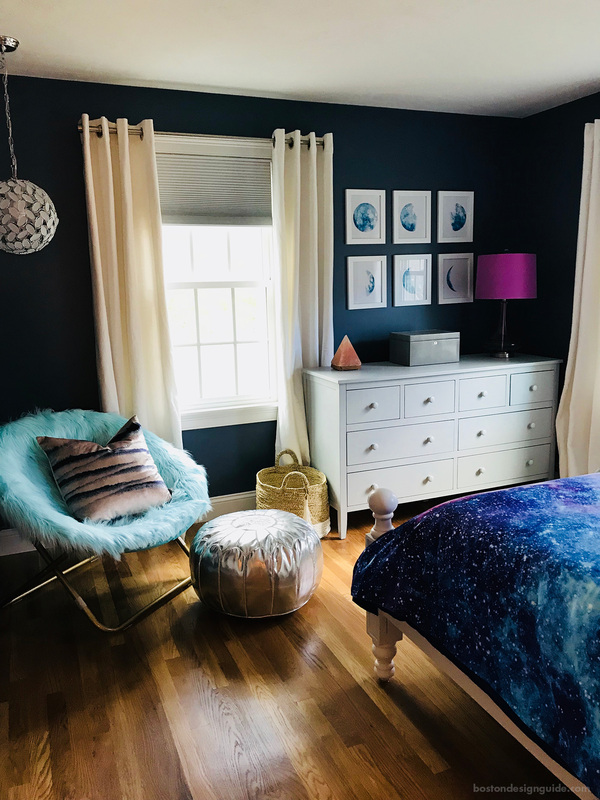 The inspiration for the bedroom of a special 12-year-old is the tween version of the refrain: “I Love You to the Moon and Back” from the classic children’s book Guess How Much I Love You. Now, while we all love Little Nutbrown Hare, we recognize that he starts to lose some street cred by age 12. Not here, however. This space by design, build and interior firm Thomas J. O’Neill, Inc. is seriously cool, with its midnight blue walls, shocks of purple and galactic bedspread. Plus, it has plenty of room for gossip sessions and slumber parties.